Colourful Solar System Mobile with movement, light and Remote Control! Our remote-controlled planet mobile is a favourite of ours, enabling children to learn about the night sky. It is also makes an ideal gift to go alongside one of our children's telescopes. Our remote-controlled Solar System Mobile features motorized planets and a Sun that lights up in the middle. You can explore the wonders of the solar system right in your own room! An audio guide to the planets is included. This Remote Controlled, motorised mobile has planets that actually orbit the sun. The sun also lights up and casts its glow on the detailed coloured planets. Listen to the included Audio CD to enjoy a fascinating tour of our solar system whilst watching the mobile in action - the CD includes fascinating information about each planet. The remote control also doubles up as a light pointer which you can use to locate each planet and to make comets and meteors streak through the night sky. 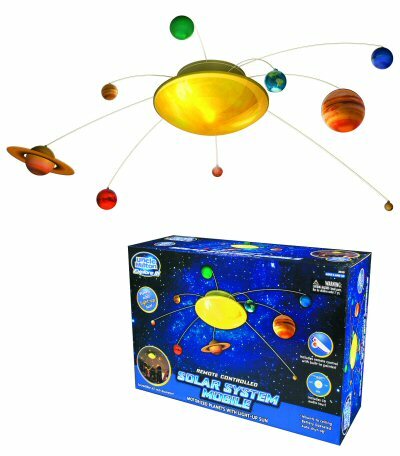 Each mobile kit includes nine full colour detailed planets, remote control with built-in light pointer and comet maker, glow-in-the-dark star stickers and the 15 minute audio CD. The mobile can be fitted very simply to a ceiling using the enclosed fixture, and as it is battery operated so there is no need to worry about connecting to the mains! Requires Batteries (Mobile - 3 x C + Remote Control - 2 x AAA). Packet of glow in the dark star stickers.